Here's what a Super Blood Wolf Moon Lunar Eclipse means and how to see it. The lunar eclipse this weekend has a rather complex name, but what exactly does it all mean? Meteorologist Michael Behrens breaks it down. TYLER, Texas — This weekend is when the next lunar eclipse is going to occur, but this one has a rather complex name. The eclipse this weekend takes on the title of a Super Blood Wolf Moon Lunar Eclipse! Now, other than sounding like a better title for a pro-wrestling cage fight, what exactly does this all mean? Let's break it down! Super: The prefix "super" is used for this eclipse because, in addition to being a lunar eclipse, this weekend's moon is also what you would call a super moon. A super moon happens when the full moon coincides with the point at which the moon is closest to the earth. This results in a moon that appears larger than normal to observers on the ground and has, sadly, nothing to do with Superman. Blood: Now the blood moon, even though it sounds like a calling for vampires, doesn't actually have anything to do with a strange ritual or even blood at all. Blood moon is simply the term used to describe the moon as it takes on a reddish color during a total lunar eclipse. This red color is caused by light coming from the sun refracting through earth's atmosphere (picking up the red color) and shining onto the lunar surface. Dracula remains innocent on this one. Wolf: The name wolf moon, a bit surprisingly based on how this article has gone so far, actually has to do with wolves! A wolf moon is the term for a full moon during January. Why is this related to wolves? Well, the first few months of the year is the mating season for wolves in the wild. We all know wolves howl at the moon, and during mating season, these howls are generally longer and louder. Thus the full moon in January is called the wolf moon. Lunar Eclipse: A lunar eclipse is an astronomical event that occurs when the earth passes between the sun and the moon. This causes the earth's shadow to be cast upon the surface of the moon darkening it. When the eclipse reaches totality, the moon will appear in a reddish color thanks to the only light hitting the lunar surface coming from solar light refracted through the earth's atmosphere. The first thing you need to look for to see a lunar eclipse is clear weather. That one we have you covered for in East Texas. While temps will be rather cold, the skies are looking to stay clear. That should mean perfect, but chilly, weather for staring up at the night sky and taking in this astronomical event! Viewing conditions for Sunday's Lunar Eclipse. 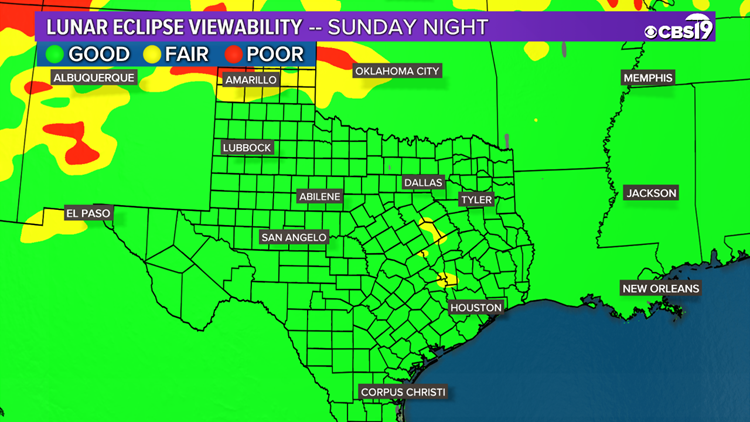 As far as what to expect, in East Texas we should be able to see a total lunar eclipse! Below is the timeline of events. 8:36 pm - Moon starts to darken. 9:33 pm - Partial eclipse begins. 10:41 pm - Total eclipse begins. 11:12 pm - Maximum eclipse. 11:43 pm - Total eclipse ends. 12:50 am - Partial eclipse ends. 1:48 am - Moon returns to normal. 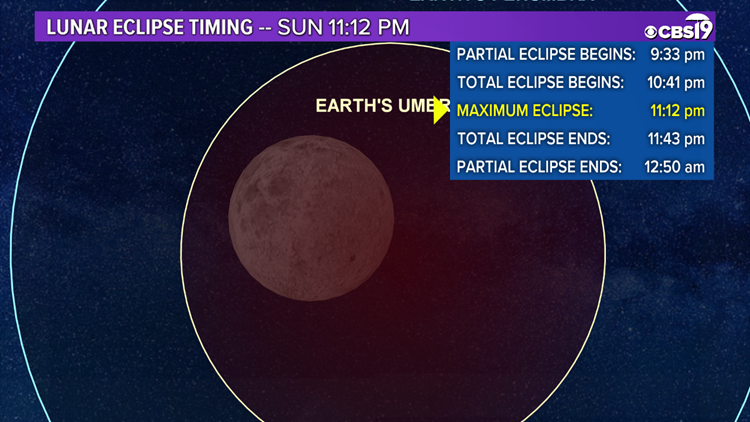 Timeline for Sunday's Lunar Eclipse. We hope you make it out to enjoy this Super Blood Wolf Moon Lunar Eclipse, as it will be the last one for the next 18 years. The next one occurs in 2037, and the next total lunar eclipse will occur in 2021.